View More In Book Lights. Soft, comfortable and non-flickering, the lighting is friendly to your eyes and reduces eye fatigue, so you can enjoy what you're doing for longer. 2 different color temperature modes for you to choose: White light and warm light. And 2 brightness level you can adjust: dim and brigt. The light holder and its arm can be 360 angle adjusted and set the perfect lighting direction and viewing for your need. No flickering and ultra-bright book light/ clip on light which is great for table, desk, dormitory and bed headboard and computer and places that can be clipped on and need lighting. Clip on: Brighten up with the click of a switch on the cord and perfect for Table, Desk, Bed headboard and Computers.The maximum wide for clip：2.36 inch. 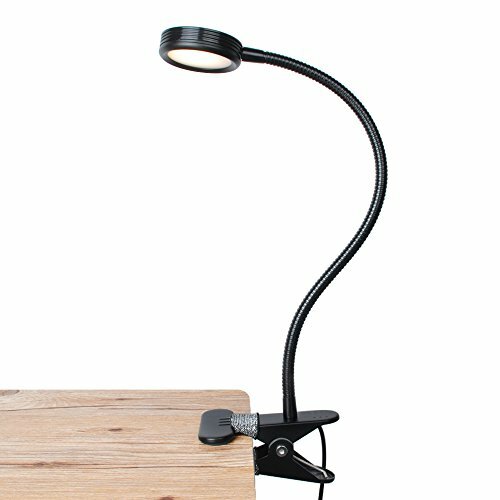 Free Angle Adjustable of arm and lamp holder, place your book light for best viewing. 2 switches on the cord. One has three options: Warm light,off and White light. The other has two options to adjust the brightness: dim and bright. A 2-prong USB AC adapter and 5 feet cord are provided to support the clip on light. FCC listed quality saves your worry. Can be used with normal 110V household current. LEPOWER Warranty: 60 days money back. 12 months warranty. We are fully guaranteed for its quality problem. Please feel free to buy!